Sports day! Every one took part and we had a great time. A special well done to Buckingham. Sports festival - we got to try out lots of different sports including football, basketball, dance, badminton, hockey, rounders, netballl and athletics. We all had a great time! Team mechanic won the car competition and will have their names printed onto the fin of the BLOODHOUND! Incredible setting descriptions. All of year 5 wrote three fantastic setting descriptions this week! These two were nominated by the rest of the class. White Blackbirds flew into our classroom! We used swiggle to research information about feathers and where these ones many have come from! Earth cries - Poem. Today we went to two locations around the school. We used our senses to note down what we could see, hear, smell and touch in our school environment. YIA science and magic workshop - Year 5 have had a great afternoon, taking part in mysterious magic. This term year 5/6 are doing fitness in Pe. 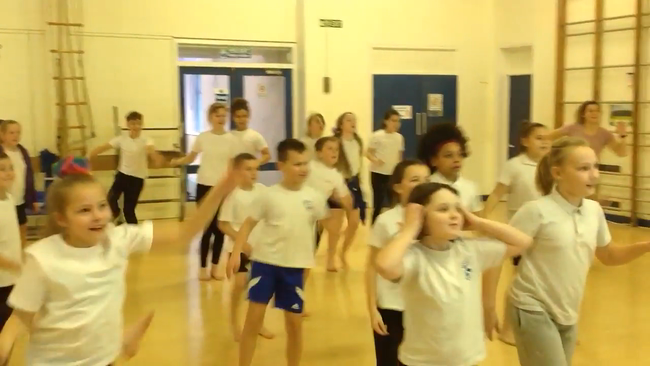 Here is a video of us doing Zumba dancing this week. Yesterday we were making posters, raps and songs to share rewards we have at Tyndale school. Rewards included: class marbles, house points, always award cup, certificates and SAM for great attendance.Here are our group posters. Homework will be given out on a Friday and will be collected in the following Thursday. -Spellings will be sent home and set within the new spelling groups. These will be tailored to you child's needs and then tested in the session. -Maths will be given out weekly and will be linked to the child's learning. On a final note, If you have any questions please come and see me. Your teachers will be filling this page with exciting class news, pictures of things we’ve done and more. Yesterday (Wednesday 15th March) we had our second visit from our STEM ambassadors - India, Lauren and Elliot. STEM stands for Science, Technology, Engineering and Maths. Two weeks ago they told us about their jobs, and how the STEM subjects helped them achieve success in their career. When they left, we had some work to do. We had to think about our aspirations for the future, and the jobs we would like to have. Then we had to think about how the STEM subjects could help us be successful. We were amazed at how many jobs used different aspects of STEM. From nurses, footballers, and YouTubers. This week we needed to write a set of instructions to guide our partner through the maze, avoiding the deadly obstacles and returning to the spaceship. This was very similar to when we used scratch on the computers at Brimsham Green and helped us consider the importance of giving clear and precise instructions to ensure our programme was successful. The afternoon flew by, and we cannot wait to see what we do with the STEM ambassadors next week!